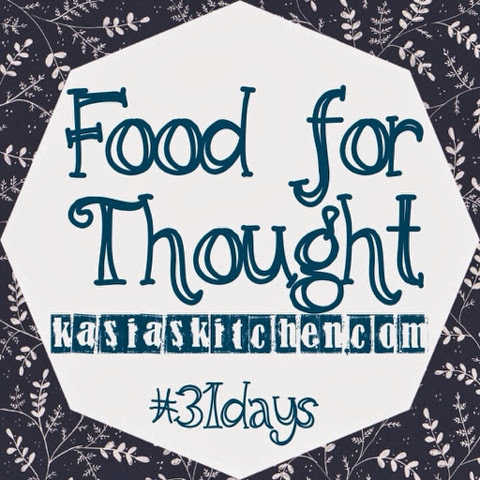 As mentioned yesterday, I’m participating in the #31days challenge to write about a specific(ish) thing for all of October and I have chosen to do a series called Food for Thought. I’ll rotate between talking about ways to make life in the kitchen more manageable and inviting you on the journey with me to actually learn to irrevocably believe God unconditionally loves me. “Why kitchen?”, is simple! 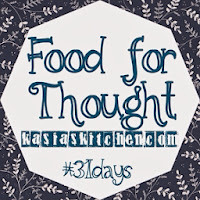 I couldn’t go 31 days without posting about things that happen in my kitchen. I am a food blogger. I love the kitchen. I want you to love it too. Several faithful readers requested time management and practical tips. “Knowing” God loves me has been something I’ve “known” for a long time. Though I didn’t grow up in a Christian home, I did grow up in church. Most children who grew up in church can sing the words, “Yes! Jesus loves me,” before they even know how to read. I’ve known for a while that actually BELIEVING God loves me has been a struggle for a me. I wholeheartedly believe He loves YOU. I just struggle with the concept of unconditional love, self condemnation, and believing that He can and does love me. I KNOW logically, Biblicaly, and in my brain that He does. But I don’t always believe that He does. It’s something I’ve talked through with my former counselor and mentors many times. I’ve had that verse memorized for so long that I don’t remember ever NOT remembering it! It never hit me like it did this past Saturday, sitting there, swallowing the lump in my throat to keep from ugly crying, steadily wiping tears from my eyes, as a 30 year old woman. I’ve probably been able to quote that verse for at least 75% of my life. I’ve always been moved by Jesus’ sacrifice in dying for me and God’s sacrifice in giving His only son. And my head has always known it was because He loved me, but in that moment it rocked me to the deepest part of my heart, that HE LOVES ME! She also said that He loves His children (ME) so much that He even takes our mistakes, failures, and the ways others try to harm us and mean for bad and uses it for good. So love. That’s why. I need to take this journey of daring to believe God loves me. As simple as it is, it’s where I am. I need to process it. I need to live in it. And what better way than the accountability of 31 days? It might be rambly. Some days will DEFINITELY be shorter than this. It might be super honest and raw. Sometimes, it might not even make sense, but I think in the end, it will be beautiful. Thanks for reading.